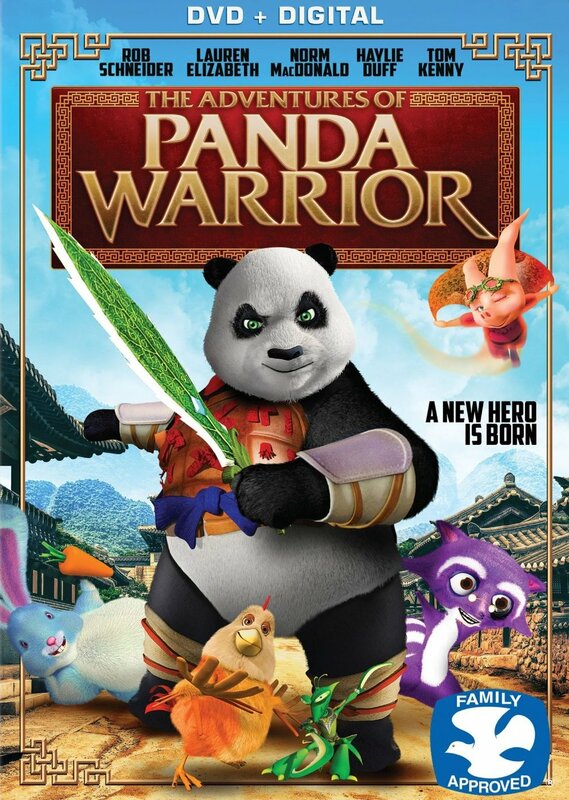 The Adventures of Panda Warrior is an obvious attempt to cash in on the huge Kung-Fu Panda movie franchise, and I don't have anything against that. I mean, if it's a good movie then who cares if they're using another warrior panda's fame to get people to see their film. Unfortunately, this is not a good movie. This isn't even an average movie. This is a flat-out bad movie. And that's a shocker considering it features the voices of Rob Schneider, Norm MacDonald, and Tom Kenny. I don't understand how they could have seen this movie and said "Yeah, I'd love to do that!". I imagine it probably went more like "I'm not doing that piece of garbage!" and then the casting dude pulls out some compromising photos. What skeletons are in your closet Rob Schneider?! Make no mistake, this movie existed prior to the voice talent coming on board so they definitely could have watched it before saying yes... unless the casting person wouldn't give them a copy. Which would probably the smart move in trying to cast this low quality film. The art and animation is computer generated but looks nothing like the big name theatrical release we've seen in the past decade. It doesn't even look as good as any of the computer generated television shows we've seen in the last decade. This looks more like a show from the 90s, or a perhaps a PlayStation 2 game, even though it was apparently made in 2012. Of course, if you have interesting or funny characters and an engaging story then the art and animation doesn't have to be great; just look at South Park. That's a great show with a fantastic movie under its belt despite (or maybe even partially due to) the simplistic art style. These characters are neither interesting nor funny... actually, let me amend that statement, these characters are not intentionally funny. They are so bizarre and nonsensical that you may very well laugh as you shake your head and think "WTF are they doing?" The story has much, much more in common with The Wizard of Oz than it does with any of the Kung-Fu Panda movie. It starts with a bunch of Chinese warriors training, with one super dorky guy with a giant nose named Jimmy Ginseng napping against a wall. He doesn't want to fight, he wants to live in peace but nobody believes that could ever happen. Later that night an attack happens and cowardly Jimmy bolts, accidentally runs off a cliff, and finds himself skydiving while at the same time face-to-face with a talking pig named Peggy Skyflyer that has long cone-shaped ears, sort of like the Twi'lek dancer in Jabba the Hutt's court. Oh, and Jimmy's a panda now. And his name is now Patrick Panda. Just because. So anyway, they're both falling and the Pig is surprised that the panda doesn't know how to fly so to rescue him she kicks him horizontally just inches before he impacts the ground... because that would totally work. After brief freak-out from the panda followed by a brief conversation between the two character, the pig starts doing and awkward little dance, squats, farts, and flies off. Then a squad of cat soldiers with swords stroll along and start attacking the panda for no apparent reason. The pig comes back, does one roundhouse kick which would never even touch the cats from where she was standing, yet it knocks them all out. Then she starts running away for some reason... because she's tired of flying maybe? Or perhaps she needs farts to fly and is all out. At any rate, she starts running and is accompanied by a very awkward running sound effect. And the panda tags along. Next they encounter a giant tarantula-like spider. Peggy and the spider box awkwardly for a bit, the spider ends up wrapping up both Peggy and Patrick in a web, but then a fart from Peggy blows the spider away and someone they are now automatically out of the web wrapping. The pair try to have a heart-to-heart over a campfire but like the rest of the movie it doesn't work, it just feels awkward. I think the voice actors do the best they can with what they have to work with, but it's painfully obvious that they are having to fit all their dialog into the pre-existing mouth movements from another language. That hurts this movie even more. Perhaps if the American product had been given the source animation so that they could reanimate the mouths to fit with what they actually wanted to say this would have been a slightly better movie. The two continue their journey and meet other people, some good and some bad. Among the good, Norm MacDonald shows up as a lion named King Leo that tells the history of the land and then helps train Patrick the panda to become the legendary panda warrior so he can defeat the evil nine-headed snake and return balance to the Force... sorry, I mean the land of Merryland. Then their journey continues through more bland backgrounds and blah, blah, blah. Really the only way to watch this is with a group of people so that you can all make fun of how extremely bad it is. Truly the only enjoyment you'll get from this is from enjoying how awful it is. I would have been truly pissed if I had actually paid money for this. Of course, really young kids may like it because they have no sense of quality. But why bother, just buy Kung-Fu Panda instead. Bringing the Characters to Life: At the Recording Studio with Rob Schneider, Norm MacDonald, Halylie Duff, Lauren Elizabeth, and Tom Kenny. Disclaimer: This was provided to me for review purposes, and although I did not pay for it I will do my best to review it as if I had.